BOGOTA, Colombia (AP) — Colombian President Ivan Duque on Friday demanded Cuba arrest 10 peace negotiators from the National Liberation Army after his government blamed the leftist group for a car bombing against a police academy that left 21 dead and dozens more wounded. In a televised address, the conservative leader said he had revoked a decree suspending arrest orders against leaders of Colombia’s last remaining rebel group, known as the ELN for its Spanish initials, who have been living on the communist-run island amid fading hopes that peace talks would resume. “It’s clear to all of Colombia that the ELN has no true desire for peace,” Duque said, citing a long list of 400 terrorist attacks attributed to the guerrillas since peace talks began in 2017. “We would like to thank the Cuban government for the solidarity it expressed yesterday and today, and we ask that it capture the terrorists who are inside its territory and hand them over to Colombian police,” he said, adding that no ideology could justify the cruelty of Thursday’s attack. Duque’s comments came after authorities claimed that a one-armed ELN explosives expert was the person who carried out the attack, the deadliest in the South American nation in 15 years. Even though Jose Aldemar Rojas had no criminal record, authorities said that the 56-year-old man is the same individual who shows up in intelligence reports as alias Mocho Kiko. He is believed to have lost part of his right arm manipulating explosives during a long clandestine career with an ELN cell near the border with Venezuela. He died in Thursday’s attack. The shock bombing recalled some of the bloodiest chapters of Colombia’s recent past and has raised tough questions about lingering security threats in the wake of a 2016 peace deal with the larger and far more lethal Revolutionary Armed Forces of Colombia. It would also appear to mark Duque’s return to the law and order platform on which he was elected last year but then somewhat moderated once he took office. While Duque stopped short of shutting the door entirely to a negotiated end to decades of fighting with the ELN, he repeated his demands that the groups immediately cease all attacks and release 16 people it is believed to be holding captive as a condition for restarting stalled talks. He also vowed to condemn any government that provides safe haven to the group — an indirect shot at Venezuela, considered by some a valuable rearguard for the clandestine cell that Rojas is accused of belonging to. “Systematic deception and irrational violence have been the constant in three decades of failed talks with the ELN,” said Duque, who earlier in the day fielded phone calls of support from several foreign leaders as well as U.S. Secretary of State Mike Pompeo. Cuba, which had been sponsoring peace talks and helped broker the historic 2016 deal with the FARC, again offered its condolences to Colombia on Friday. Cuba’s foreign ministry “will act with strict respect for the Protocols of Dialogue and Peace signed by the Government and the ELN, including the Protocol in Case of a Rupture in Negotiations,” wrote foreign minister Bruno Rodriguez. Cuba has strongly condemned terror activities and expressed its solidarity with Duque’s government, even cancelling a reception at its embassy in Bogota to commemorate the 60th anniversary of Fidel Castro’s revolution. 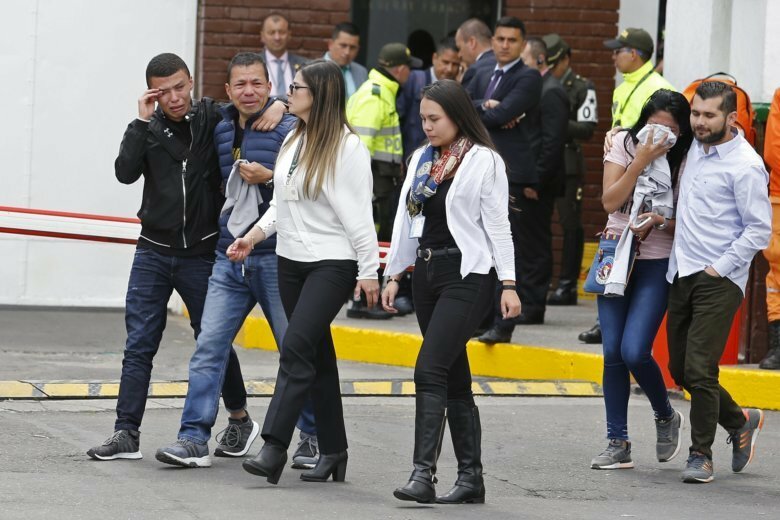 Overnight, the death toll from the bombing more than doubled to 21, the worst tragedy since a 2003 car bombing carried out by FARC rebels against an elite Bogota social club that killed 36. It proved especially unsettling because the target, the General Santander police academy, is one of the city’s most protected installations. With the help of security cameras and fingerprints on his one-remaining hand, investigators were able to quickly identify Rojas and determine that he was the owner and driver of a 1993 Nissan-pick up that was loaded with 80 kilograms (175 pounds) of pentolite carried out the attack. Defense Minister Guillermo Botero said Rojas entered the heavily guarded facility via a side entrance used for deliveries, driving fast through a gate opened to allow the exit of a few motorcycles. He then maneuvered into the heart of the leafy campus where the vehicle exploded in front of a red tile-roofed barrack used by female cadets just after an honor ceremony had ended. Less than 10 minutes before the blast an unidentified man descended from the vehicle at a nearby bus stop — an indication the bomb may have been activated remotely and not an unprecedented suicide bombing as some had initially speculated. Investigators are now trying to determine whether that man is Ricardo Carvajal, who acknowledged taking part in the attack in phone calls intercepted by police. Carvajal was arrested in a pre-dawn raid in Bogota on Friday in which authorities also seized a rebel combatant manual. “This was an operation being planned for more than 10 months,” Botero said. Only a small number of the 20 deceased cadets have been fully identified because the bodies of the young victims were badly mutilated. Family members have been asked to provide DNA samples to a team of forensic anthropologists trying to identify the dead from among a list of unaccounted-for cadets. The dead identified thus far include Erika Chico, a top-of-class cadet from Ecuador who had identification on her at the time of the attack. Of the more than 70 wounded, including three students from Panama, 10 remain hospitalized. Also killed was Alan Bayona, who just a few years ago outsprinted 100 other athletes at 800-meters in a nationwide track championship. Little is known about Rojas. Records show he bought the car 10 months ago from Mauricio Mosquera, who authorities said was charged in the past for terrorism and rebellion. The car was last inspected six months ago in the eastern city of Arauca, near the border with Venezuela. The same border region is a stronghold of the ELN, which has been stepping up its attacks on police targets and oil infrastructure in the volatile area. Authorities said Rojas traveled on several occasions to Venezuela to train rebels in the use of explosives. In the past two decades the Cuban revolution-inspired group, which is believed to have around 1,500 fighters, has never been capable or shown much interest in carrying out high-profile act of violence. Jorge Restrepo, director of the Conflict Analysis Resource Center, said the ELN’s decentralized and politically-fragmented leadership is a major obstacle to peacemaking. He said the Domingo Lain front to which Rojas is believed to have belonged may have been looking to sabotage the outreach efforts of the ELN leadership in Cuba, who likely had little idea such an assault was in the works. The same unit was behind a similar remotely-activated car bombing of a police station in the coastal city of Barranquilla a year ago that left five officers dead. “They are one of the strongest militarily and one of the least committed to the peace process,” he said of the hardline cell. AP writers Christine Armario and Cesar Garcia contributed to this report.